Take the North Marietta Pkwy. Exit#264. Go right, continue to the traffic light. Turn left onto Cobb Parkway. Immediately get into right lane and turn right onto Austin Ave.
Continue straight about ½ mile. You will pass two churches on the left at the four way stop signs. The next block will be the intersection of Washington Ave. and Austin Ave.
Providence Community Baptist Church wll be on your left. Merge on to S. Marietta Pkwy. Turn right on to Cobb Pkwy. Continue to Roswell Street (Big Chicken). Turn left on to Roswell Street. Continue on Roswell Street, then turn right on to Austin Avenue. 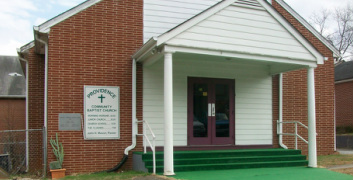 Church is located on the right at the corner of Austin Ave. & Washington Ave.